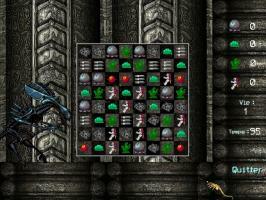 A match-3 type game, starring the Alien Queen from the Alien Saga. French game, English text available. English instructions included. Make lines with at least 3 objects of the same type. - Eggs make you lay facehuggers - Humans can recept facehuggers and create soldiers - Food is needed to lead your soldiers to a new planet - Plant can be used in the research department to increase your attack power - Beware of the missiles ! Humans can hurt you. You must invade all the 9 planets of the solar system to win. Thanks to Asraroth for the match-3 engine, and toH.R Giger for the original Alien design ! 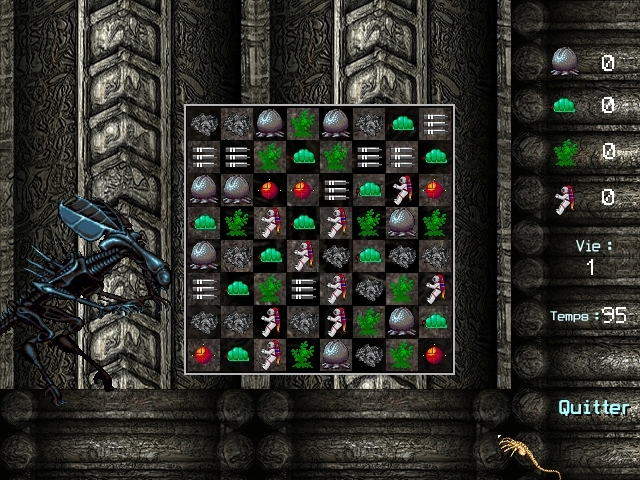 "Taken at first glance, Alien: Puzzle Invasion seems like a rudimentary match 3 game, but after playing it you realize the author has cleverly turned it into a strategy game with very light management options as you gather humans, plants, and food in order to create an army of aliens with which to assault tougher planets. For some reason the English translation file didn't work, and clicking on quit in the match 3 game QUITS THE GAME rather than drops you back to the management screen (this came as a bit of a surprise), but aside from a few minor issues it's a really interesting and clever game!"